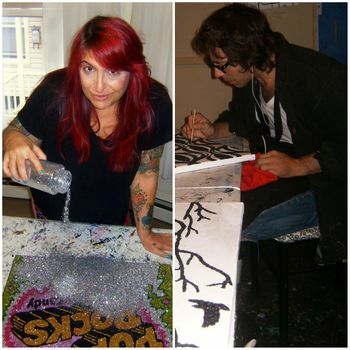 Meet Featured Artists, Sue Zola & Evād! Zola & Evād's artwork is on display now until September 5 at our South Lamar location and again November 6-January 8 at our Round Rock location. Zola is originally from New Haven, CT where she became a prominent local musician. As she grew progressively more tired of the cold weather in the Northeast, Zola packed up her pick up truck and her two cats and headed toward Austin one day in October of 1999. Having a music teacher for a mother and being a musician herself, it's easy to understand why Zola was drawn toward the Music Capital of the World. ...the original Kerbey Lane Cafe! 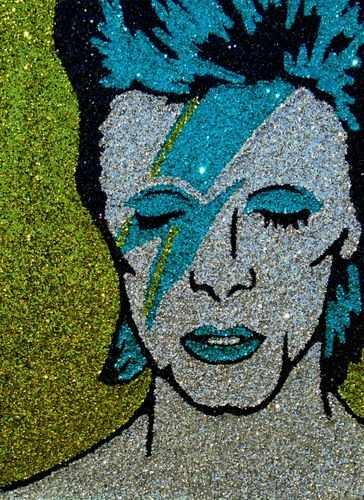 As a night-shift manager at our Central location on Kerbey Lane, she began making glitter art in 2000 as a way to unwind during the early morning hours after her shift had ended. Zola's unlikely inspiration was a glitter picture frame she stumbled upon while perusing the aisles at Goodwill, and the rest is history! Her first art show was at Kerbey Lane in 2001. Zola began to gain recognition through having celebrities purchase her work and through gallery interest, which was unique for an artist who had exclusively displayed in restaurants and coffee shops. 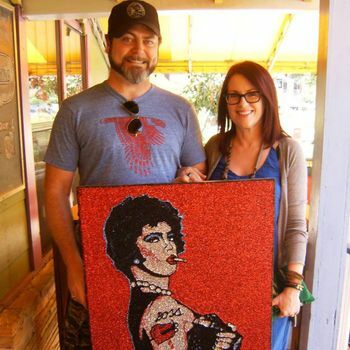 Celebrities who own Zola's work include famous film directors Quentin Tarantino and David Lynch, Billy Gibbons of ZZ Top, Black Francis of the Pixies, and celebrity couple Nick Offerman and Megan Mullaly (pictured in front of Kerbey Lane Central). The work you see on display at our South Lamar location is created mainly by Zola's apprentice, Evād (Dave spelled backward), who also happens to be her husband. Evād (a.k.a. Dave Tyson) was born and raised in the small town of Borger, TX, but has called Austin home since 1991. 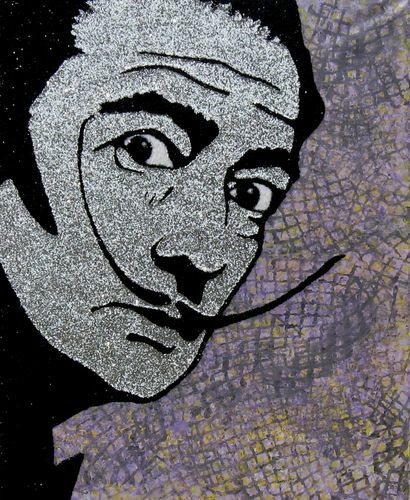 Zola is inspired most obviously by the pop art genre and also by street art. She credits Evād with bringing more of the street art style into his pieces with the addition of acrylic paint backgrounds. 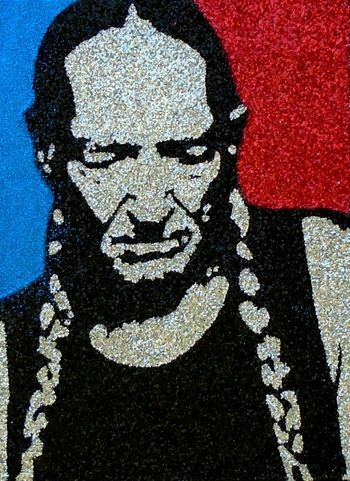 Evād creates glitter art pieces using stencils, which allows the couple to keep their art accessible, ranging in price from $125-$350 per piece. Today, Zola creates only one-of-a-kind pieces. She is still into pop art, but it's become more abstract and deconstructed. 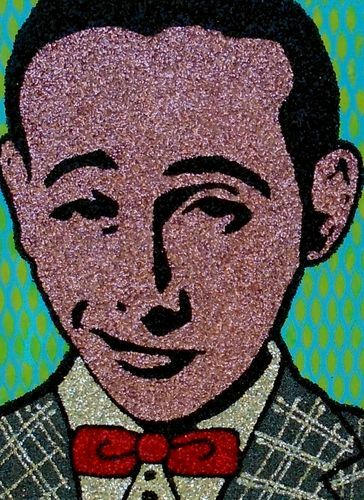 All of the couples glitter art pieces are made using glitter and glue on canvas, as Zola explains they are, "essentially painting with glue." 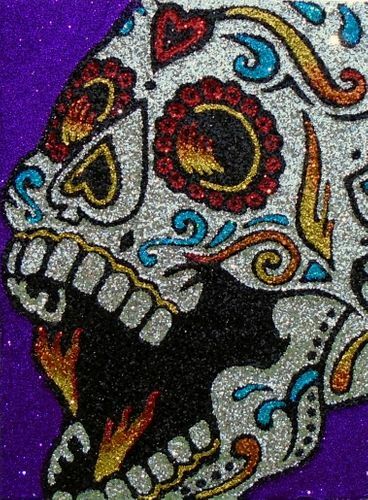 First, the subject is outlined using glue and then black glitter is poured over it and allowed to dry. Each color must be done one at a time. Because of the glue's tendency to drip and the drying time involved, Zola and Evād must work flat. In order to prepare for a show, the couple will work on as many as 15 pieces at a time. Zola continues to work 6-7 hours per day on glitter art, but when she isn't dousing canvases with sparkles she enjoys reading, being outside, and hanging out with friends at home. This summer, she and Evād spent most of their time on the beaches of Connecticut. You can see more of Zola's artwork on her website: suezola.com and on Instagram. All of Zola & Evād's works displayed at Kerbey Lane Cafe are for sale. Questions for Sue & Dave? Send them an email.